P5	P7	P9 What are Natural Resource Charter precepts? Resource management requires maximizing the costs for affected communities, while enhancing the benefits. 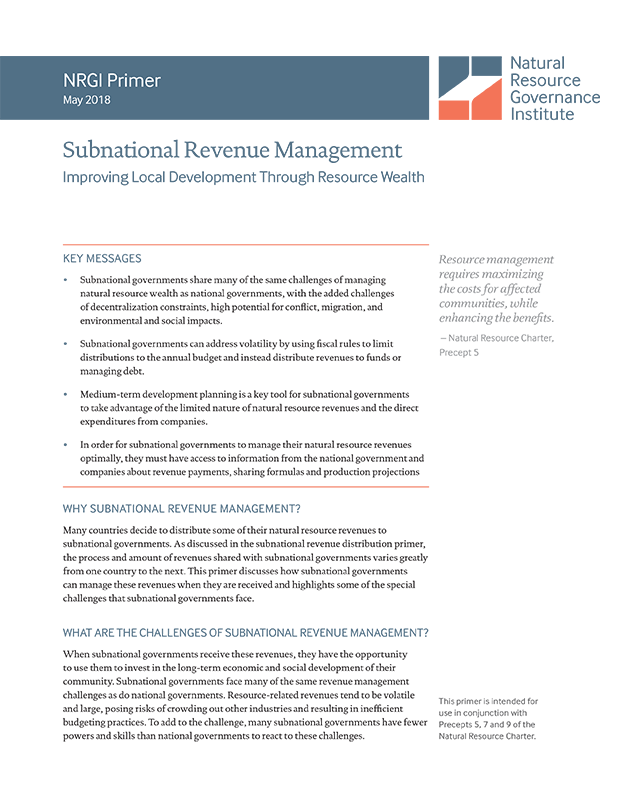 Subnational governments share many of the same challenges of managing natural resource wealth as national governments, with the added challenges of decentralization constraints, high potential for conflict, migration, and environmental and social impacts. Subnational governments can address volatility by using fiscal rules to limit distributions to the annual budget and instead distribute revenues to funds or managing debt. Medium-term development planning is a key tool for subnational governments to take advantage of the limited nature of natural resource revenues and the direct expenditures from companies. In order for subnational governments to manage their natural resource revenues optimally, they must have access to information from the national government and companies about revenue payments, sharing formulas and production projections.